1953 was a momentous year both tragic and gloriously happy. At the end of January a violent storm gathered in the Irish Sea. Travelling round the north of Scotland it met the high spring tide in the North Sea. Driven by hurricane winds it came down the east coast creating a surge, which inundated many parts of eastern England. We were all stunned at the sudden and devastating floods that overtook the eastern counties. Three hundred and seven lives were lost, including 133 aboard the ferry ‘Princess Victoria’ which foundered east of Belfast. Thousands were made homeless by the 8 feet of floodwater, which covered the area as far as five miles inland. Coming while people slept, and with no warning there was no escape from the chalets and bungalows, which were a feature of the area. As the stories of awful experiences and tragedies gradually became known the whole country was affected by the loss. The Coronation of our new Queen was eagerly anticipated in June of that year. 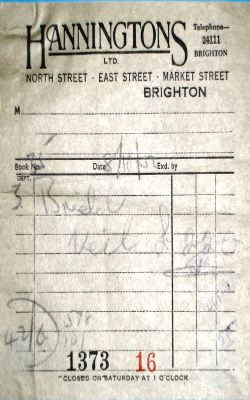 A number of very early morning trains ran from Brighton Station to Victoria to take those who wished to be present to see the Coronation procession. The trains were crowded and happy anticipation was in the air. The wait in the Mall for several hours in drizzling rain did nothing to dampen everyone’s enthusiasm and every passing dustcart and workman raised a cheer. The excitement of the forthcoming day was topped by the news that Edmund Hilary with Sherpa Tensing had conquered Mount Everest. Television was in its early days and many families had obtained a television set especially to watch the Coronation. In those days the television had to warm up before a picture appeared, and it was considered necessary to put a cover over the set. Recordings and film of the scenes in the Abbey and in the Mall have been shown many times, but to be there experiencing the atmosphere, and the sight of the Golden Coach carrying a Queen who was not much older than I was myself, was a lasting memory. The Coronation gave everyone a reason to celebrate. The opportunity was taken to arrange street parties and Lynton Street was no exception. Most households had a patriotic flag to hang up and streamers were strung across the street. Tables, cloths and chairs appeared as if by magic. The tables were laden with party goodies despite the continued rationing of some foods. 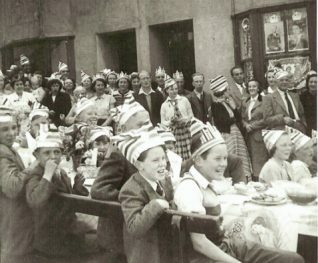 Paper hats were essential the adults letting their hair down with community singing to Grandma’s piano which had been carried into the street. At the end of the day, with everything cleared away and the street tidy, all had had a good time and went to bed tired but happy. By this time my husband-to-be had finished his course at the Technical College and had taken up a position with the Marconi Company in New Street Chelmsford. Our wedding date was fixed for September of 1953. 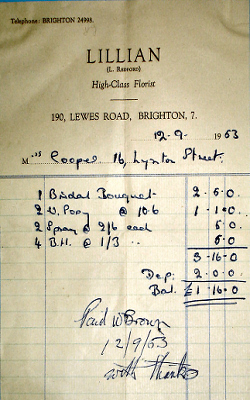 Since our engagement in 1949 I had been collecting what was still termed in the traditional way ‘my bottom drawer’. Christmas and birthday presents had been household rather than personal but this all helped to furnish the home that we would have together. This was taking up a lot of space, and when I had the opportunity to purchase at a very reasonable cost, an almost new utility dining room suite I was very grateful to my future in laws who found room to store it. By 1953 it was possible to arrange a wedding ‘with the trimmings’, although ‘the trimmings’ were nowhere near as elaborate as they are today. A local dressmaker made my dress, and the veil was purchased at Hanningtons in North Street. 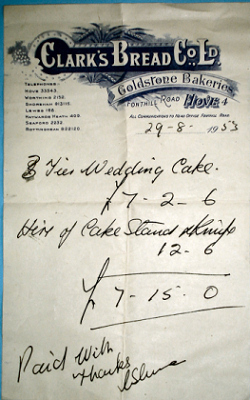 Clarkes the Bakers also in North Street made the three-tier cake and ‘Lilian’ in Lewes Road arranged the bouquets. In those days we were pleased to receive whatever presents friends and relatives chose to give and the wedding list was one of promises rather than requests. I had been employed by Premier Motor Policies for eight years and in that time the Branch had grown and moved to larger premises in Queen’s Square. My wedding gift from the Branch was a canteen of cutlery. The wedding day dawned dry but overcast and remained so all day. The marriage service was held at St Wilfrid’s Church and the wedding breakfast at St Wilfrid’s Hall where we had both spent so much of our time as members of all the youth organisations. Within a short time I would be leaving Brighton to start married life in rooms we had been fortunate to get in Chelmsford. It was a bittersweet day when we left Brighton to start our new life leaving the old one behind. As the train steamed out of Brighton Station, the last glimpse of home was the cross on the tower of St Wilfrid’s Church which was visible from the railway line. 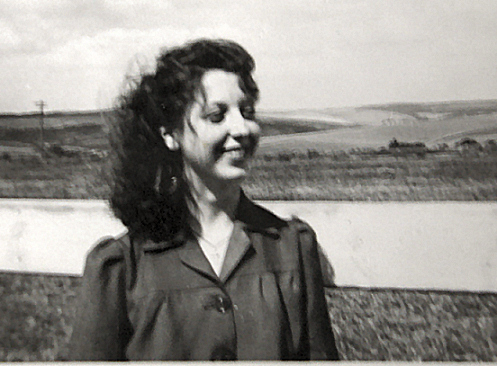 It is now 54 years since I left dear old Brighton, but I have only to close my eyes and I am standing on the racecourse with the wind in my hair and the skylarks singing and I am eighteen again.